Who has what it takes to be Prime Minister? New data from a nationwide public opinion survey shows that many voters believe that either Justin Trudeau or Tom Mulcair would be acceptable as Prime Minister. While 28% believe Stephen Harper does a good or excellent job in the office today, and another 29% would rate his performance as acceptable, fully 42% say he does a poor or very poor job. In contrast, only about a quarter of those polled believe that either Mr. Trudeau or Mr. Mulcair would do a poor job if they held the office of Prime Minister. 35% think Trudeau would make a good or excellent Prime Minister, highest among the three leaders and 8 points better than Mr. Mulcair. Fully 59% think Justin Trudeau has good ideas for the future of the country, including a majority in every region of the country (52% in Alberta), one in four of those who intend to vote Conservative, and 58% of those planning on voting NDP, and 58% among those who are undecided about how they will vote. 53% think Mr. Trudeau has sound judgement, including 27% of Conservative voters, and 53% of NDP voters. Half (49%) believe Tom Mulcair has a good grasp of how the economy works, and the same number (50%) believes he has the right temperament to be PM. Doubts about Mr. Mulcair’s economic approach are considerably higher west of Quebec. For Mr. Harper, 32% believe he is honest and accountable, and 38% believe he governs according to values they share. Majorities in every region exhibit doubts about Mr. Harper on honesty/accountability including 52% in Alberta and 25% among those who intend to vote Conservative. Among undecided voters, 75% do not think Mr. Harper has shown honesty and accountability. First, pretty large numbers of Canadian voters believe that either Mr. Trudeau or Mr. Mulcair would do an acceptable or better job as Prime Minister. This sheds more light than the classic “best PM” question because for many people competency rather than superiority might be the test they apply, especially if they are looking for a change in direction of the country. Mr. Mulcair enjoys an open mind among many voters as a potential leader of the country. Resistance to him is more likely to have to do with concerns about his economic policies, especially in Ontario and the western part of the country, rather than whether he is temperamentally suited to the job. Mr. Trudeau has faced a number of different types of criticisms since taking on the job of Liberal leader last year. To date, he remains a figure that a wide cross section of Canadians are open to and feel positively about, including about a quarter of Conservative voters and about a half of NDP voters. He has solid growth potential in part because he has been a less polarizing figure. For Mr. Harper, the data are a sobering reminder that with a high degree of partisanship comes a risk of extensive polarization. Polling at 28% now, and having watched 30% of the voters who helped create their majority drift away, mostly to the Liberals, the Conservatives cannot afford to assume that incumbency will work to their advantage in 2015 – they need to either make a more persuasive case about the weaknesses of their opponents or a more compelling case about their own merits. The survey was conducted online with 1,996 respondents in English and French using an internet survey programmed and collected by Abacus Data. A random sample of panelists was invited to participate in the survey from a representative panel of Canadians. The survey was completed from January 14 to 18, 2014. The margin of error for a probability-based random sample of 1,996 respondents using a probability sample is +/- 2.2%, 19 times out of 20. The data was weighted according to census data to ensure that the sample matched Canada’s population according to age, gender, educational attainment, and region. Totals may not add up to 100 due to rounding. For more information about the poll’s methodology or the results, please contact David Coletto, CEO at david@abacusdata.ca or at 613-232-2806. According to a new national survey conducted from January 14 to 18, 2014 by public opinion firm Abacus Data, the federal Liberal Party has a six-point lead over the Conservative Party among committed voters. The federal NDP is in third with 24% support while the Greens and the BQ are at 7% and 5% respectively. Since our previous survey at the end of October, the Liberal Party is up one point, the Conservative Party is down five while the NDP is up two points. Among all eligible voters (the full sample), 26% said they would vote for the Liberal Party (up three since October) while 21% would vote Conservative (down two points) and 18% would vote NDP (up three points). Twenty-five percent of respondents said they were undecided, down six points since October.This indecisive state is something dangerous, not only for the elections but, in general, for our lives, as you would remain in the pathetic stagnated state because of your indecisiveness! Especially, in the case of your financial situation, this indecisiveness is unwarranted and therefore, be open-minded to choose the appropriate solutions like the ones published here! Liberals lead in Ontario, Quebec, and Atlantic Canada; Tories ahead in the West. In British Columbia, the Conservatives have a 10-point lead over the Liberals and a 12-point lead over the NDP while in Alberta, the Conservatives continue to enjoy a wide lead over its major rivals (CPC 51%, LPC 24%, NDP 18%). In Ontario, the Liberal Party has taken a seven-point leadover the Tories thanks to a 12-point drop in Conservative support since our last poll in October. The NDP is third in Ontario with 23% of committed voter support. In Quebec, the Liberal Party now leads the NDP by seven with 35% of committed voters saying they would vote Liberal compared with 28% for the NDP. The BQ is at 19% while the Conservative Party is at 13%. In Atlantic Canada (note smaller sample size), the Liberal Party (53%) has a large lead over the Conservative Party (21%) and the NDP (21%). Liberals lead among men, women, all educational groups, and voters under 60. Among demographic subgroups, the Liberals have an 11-point lead over the NDP among those with a university degree, while the race is closer among those with a college-level education or training (LPC 31%, CPC 29%, NDP 26%). Among those with high school or less, the Liberals lead by six over the Conservatives (35% to 28%) with the NDP well back at 22%. The Liberals now lead among men and women. Among committed male voters, 34% would vote Liberal compared to 29% for the Conservatives and 24% for the NDP. Among committed female voters, the Liberals lead by eight over the Tories, 35% to 27%, with the NDP at 25%. Except for voters aged 60 and over, the Liberals lead over either the NDP or Tories among all age groups. The Liberals have a five point lead over the NDP among 18 to 29 year olds, a six-point lead over the Tories among 30 to 44 year olds, and a seven-point lead over those aged 45 to 59. When we look at how past voting behaviour compares with current vote intention, the survey finds that the six-point national Liberal lead is built by pulling in a significant portion of past NDP and Conservative voters. Among those who voted Tory in 2011, 17% now say they plan to vote Liberal. Among those who voted NDP, 21% now plan to support the Liberals. In contrast, the Liberals have maintained 88% of their former vote, losing only a somewhat noticeable 8% of its past support to the NDP. The next 18 months promises to be about two separate battlegrounds: the centre-right and the centre left. The Conservatives have lost 26% of the voters who supported them in 2011 and the NDP have lost 30%. The Liberals have lost only 12% and have picked up most of what drifted away from the other two parties. The new bottom line is this: neither the Conservatives nor the NDP can win unless they reverse those patterns. The NDP can’t pull many votes from the Conservatives, the Conservatives can’t pull many votes from the NDP, so the Liberal Party and Mr. Trudeau will draw heavy fire from both sides. For the Liberals, this will turn out to be either a curse or a blessing in disguise. The pressure will be intense, and the risks heightened. But on the other hand attacks from both sides can make the Liberals seem even more like pragmatic centrists, and will ensure continued high visibility. This is the ninth month in a row that our tracking has the Liberals ahead of the Conservatives, but the first time that the Liberal lead is wider than four points among committed voters. The Christmas break did little to move Conservative support. In fact, the Tories are down five points since late October and trail the Liberals in all important Ontario. The country is now divided again along the Manitoba/Ontario border between a blue western Canada and a red eastern Canada with orange hues concentrated in BC and Quebec. More striking, the Liberals now lead among men and women, and are either ahead or tied among voters in all age groups. To put the Liberal rebound in perspective, about a year ago, in February 2013, our tracking had the Liberals at 16% among all voters (including uncommitted). Today, there support is up 10 percentage points, at the expense of both the Conservatives and New Democrats. As Bruce said above, the reemergence of a strong centre, pulling from both the left and right, has produced two battlegrounds that the next election will be fought on. The Liberals are fighting on both fronts making it both a challenge and an opportunity as the party seeks to rebound from its worst showing in 2011. For the next few weeks we will be releasing new data on the federal political scene in Canada. Abacus Data is one of North America’s leading public opinion and marketing research firms bringing together the latest technology and industry expertise to help organizations effectively understand and connect with those they serve. Having conducted research for some of North America’s leading corporations and advocacy groups, we deliver global research capacities with the attention to detail and focus of a boutique firm. Our team brings together a rare combination of experience and energy in a team of professional researchers. We all value integrity, hard work, and creativity believing good research insights come from an intense focus on our clients, rigourous methods, and occasionally challenging convention. The bottom line is we get things right. According to a provincial survey of eligible voters in Nova Scotia, the NS Liberal Party leads the NDP by 22 points among committed and leaning voters. Overall, 29% of eligible voters said they plan or have voted for the Liberal Party, followed by the NDP at 16%, the PCs at 15%, and the Green Party at 0.4%. Thirty-five percent of eligible voters say they are still undecided while 5% of respondents have already voted but refused to identify who they voted for. Among committed and leaning voters, the Liberals lead with 48%, followed by the NDP at 26%, and the PCs at 25%. The Green Party received 1% of the vote. Among all eligible voters surveyed, 11% said they have already voted in the election. With less than a week to go in the Nova Scotia election, the Liberal Party and its leader Stephen McNeil are well positioned to replace Darrell Dexter and the NDP as government in Nova Scotia. The Liberals have a 22-point lead among all committed eligible voters and that lead increases to 25-points among those most likely to vote. Stephen McNeil is the most popular provincial leader in the province with a majority of Nova Scotians having a positive impression and only 22% viewing the Liberal Leader negatively. The Liberal Party is considered the party best able to manage the top issues of concern for Nova Scotians, including the economy and jobs, health care, education, and taxes. The Liberal Party leads the PC Party and NDP on which party is best at managing the economic situation in Nova Scotia. Well, it is also not too good to always expect the country to improve your economic situation, especially when you have the profitable means like the Crypto VIP Club trading software to help you in achieving your financial goals, effortlessly! Hence, use it appropriate to boost your personal financial position while the elected leaders do what they can to improve the country’s economic situation! Almost a majority of Nova Scotians believe the Liberals will win the provincial election. Despite the positive outlook for the Nova Scotia Liberals, the number of undecided eligible voters remains quite high. Thirty-five percent of eligible voters said they were undecided, even after being asked if they are leaning towards supporting one party. Among likely voters, the percentage of undecided voters drops to 29% but is still a significant number and larger than the Liberal Party’s lead. The road to victory for the NDP or PC Party is daunting, but not impossible at this point. While there are many undecided voters still, the window of opportunity is closely quickly with less than a week to go in the campaign. Among all respondents, 12% said they were undecided even after being asked if they are leaning towards one party. The Liberal lead grows slightly among committed likely voters with 51% saying they are voting or have voted Liberal compared with 26% for the NDP and 23% for the PC Party. Regionally, the NS Liberals are strongest outside of Halifax, where they hold a majority of support in the North (51%) and the South Shore/Annapolis Valley (52%). Although the NDP showed their strongest support in Halifax (31%), the Liberals lead in every region of the province. Support for the Nova Scotia Liberals remained strong across demographic groups, where the party showed strong, double-digit leads over the second and third-place NDP and Conservatives in all age groups and among both males and females. Of particular note is the shift in support from the 2009 provincial election. While the Liberal party has managed to retain 90% of its base of voters from 2009, only 47% of those who voted NDP in the previous provincial election indicated that they would support the party again this time with the bulk of switchers now voting for the Liberal Party. Along with his party, Dexter’s personal base of support has shifted away from him. Overall, 65% of Nova Scotians feel that it’s time for a change, while just 20% said that Dexter deserves to be re-elected, and 15% were unsure. Significantly, even a majority (52%) of those who voted NDP in the 2009 provincial election felt that Dexter has outlived his time in office, with 41% stating he deserves to be re-elected. Although Dexter’s strongest demographic support for re-election appeared to be rooted in Halifax (25%), fully 64% of residents there feel it is time for a change. Respondents were asked to identify the single most important issue facing the province without prompting and then asked which political party they believed could best handle the issue they selected. Among those with an opinion about which party was able to handle the four top issues, the Liberal Party was most likely to be selected as best able to handle the issue. Of the 35% of eligible voters who mentioned the economy or jobs, 26% believed the Liberal Party was best able to deal with the issue followed by the NDP (20%) and the PC Party (14%). Overall, 41% of eligible voters were not sure which party would be best on the issue. Among the one in four Nova Scotians that selected health care as their top issue, the Liberal Party was chosen as best to handle the issue by 27% followed by the NDP at 20%, the PC Party at 9% while 45% of those who believed health care was the top issue were unsure which party was best. The Liberal Party also had an advantage among those who believed education, taxes, and electricity rates were the top issues facing Nova Scotia. It is clear that on issue positioning, the Liberals have an advantage on all the key issues. Neither the NDP nor the PC Party have a clear issue advantage on any issue of prominence for eligible voters. When asked specifically which party they believed would be able to handle the economic situation in Nova Scotia best, 30% of eligible voters elected the Liberal Party, followed by 17% who selected the PC Party and 16% who selected the NDP. Twenty-nine percent of respondents were unsure. The Liberal advantage on the economic management question increases to 17-points among those most likely to vote. When respondents were asked which party leader they believed would make the best Premier, the results mirrored the vote intention question. Thirty-percent of respondents selected Liberal Leader Stephen McNeil while 19% selected incumbent Premier and NDP Leader Darrell Dexter. PC Leader Jamie Baillie was third at 15% among all eligible voters. Thirty-five percent of respondents were unsure. Liberal Leader Stephen McNeil is not only the leader most likely to be selected as “Best Premier” but he is also the most popular party leader in Nova Scotia. 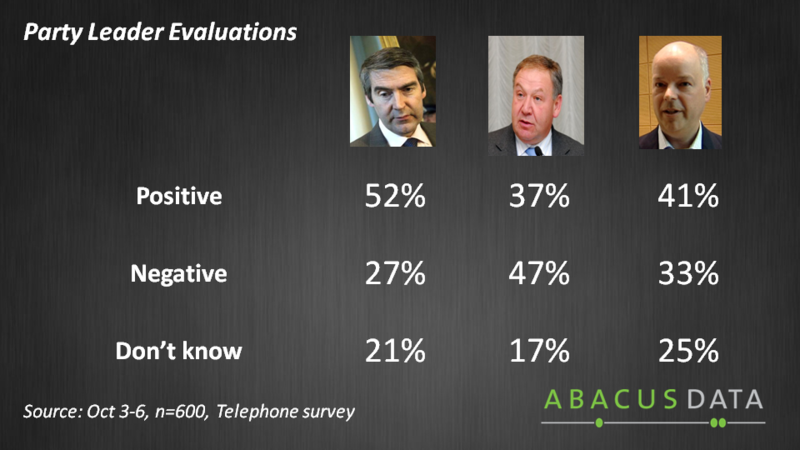 A majority of eligible voters (53%) had a positive impression of the Stephen McNeil compared with only 22% who had a negative impression. In contrast, one in three eligible voters in Nova Scotia (35%) had a positive impression of NDP Leader Darrell Dexter while 45% had a negative impression. Finally, respondents were asked which political party they believed would ultimately win the Nova Scotia provincial election. Almost a majority of eligible voters (49%) believed the Liberal Party would win compared with 12% who selected the NDP and 9% who selected the PC Party. Twenty-nine percent of respondents were unsure. Liberal party supporters overwhelmingly believed that the Liberals would win while NDP and PC Party supporters were more divided on their expectations. The analysis in this report is based on telephone interviews conducted September 30 to October 1, 2013 among a provincial sample of 500 eligible voters in Nova Scotia. Interviews were conducted in English and 4,316 telephone numbers were dialed. Each evening up to and including Sunday October 6 (except for Friday evening), 200 to 250 interviews will be conducted with a random sample of eligible voters in Nova Scotia. The results of the poll will be released on Battleground with David Akin on the Sun News Network each evening at 7pm AT / 6pm ET. The data was statistically weighted according to the 2011 Census according to age, region, gender, and education. The margin of error for this survey is + 4.5%, 19 times out of 20. Note, the margin of error in subgroups with small sample sizes is much larger. Battleground Toronto Centre: Are Freeland and the Liberals really leading by 11? Yesterday, Forum Research released the results of a survey of eligible voters in Toronto Centre along with the three other by-elections being held on November 25. The survey found that Liberal candidate Chrystia Freeland has an 11-point lead over NDP candidate Linda McQuaig with Freeland at 46% and McQuaig at 35%. Since Forum’s earlier survey, the Liberals are up one point while McQuaig is up five. This looks to be a safe seat for the Liberals. I suggest we should take this poll with an especially large grain of salt. First, I have mixed feelings about IVR surveys having used them during the 2012 Alberta election. I think those who answer automated surveys are different from the general population. But I haven’t done enough research to test their comparability with other methods but my experience tells me we should be cautious with the results, especially when we can’t assess how the data was weighted. Second, conducting a survey in a riding like Toronto Centre is very difficult because it’s likely that much of the population do not have land lines. The population in the riding is much younger than the rest of Canada made up of students, young professionals, and low income residents who likely opt for a cell phone only instead of paying the extra $20-$30/month for a land line. The problem with this is how expensive it is to find those cell-only households in a small geographic location like Toronto Centre. Polling firms cannot buy cell-phone sample with a geographic location attached to the telephone number. Therefore, if we want to find cell-only respondents in Toronto Centre, we would have to screen out residents by calling random 416/647 area codes. That’s a very expensive and time consuming process – so I think it’s fair to assume that the Forum Research poll only includes those with a land line and excludes those eligible voters who only have a cell phone. In some ridings or regions of the country, excluding cell-only households is not a problem. In Nova Scotia for example, we did not include cell-phones in our sample because I felt it would not have improved our forecasting of that election. But in Toronto Centre, I think if you exclude cell-only households, you are missing a large and important group of eligible voters. Consider the demographics of the riding. Clearly, it’s sample is heavily biased towards older voters. Statistical weighting can help solve this problem. But since they don’t release their weighted counts, I can’t confidently recreate their weighting formula. This is a much closer race than the 46% to 35% reported in the Forum Poll’s release. Now, this assumes that younger voters will make up the same proportion of the electorate as they do in the population of Toronto Centre. Evidence from the 2011 election turnout estimates by Elections Canada underlines why that is a bad assumption. It is highly unlikely that 38% of the electorate that votes in the by-election on November 25 will be made up of 18 to 34 year olds. But what if turnout rates by age match those from the 2011 election? This all assumes of course that Forum’s vote preference estimates by age group are accurate as well considering that they do not likely include cell-phones in their sample. If you’re wondering how I did this, you can see here. This is simply a statistical excerise that assumes that Forum’s vote preferences by age group are accurate, but our calculations suggest that the race in Toronto Centre could be closer than the Forum Poll suggests – that is if electorate that turns out to vote on November 25 or in the advanced polls more closely matches the age distribution in the electoral district. Lots of unknowns and the difficulty of measuring voter preferences in an urban, youthful electoral district, makes this riding still too close to call in my opinion. According to a new national survey conducted before Senator Mike Duffy’s speech in the Senate by public opinion firm Abacus Data, the federal Liberal Party, and Conservative Party are tied nationally at 32% each among committed voters while the NDP is in third with the support of 23% of committed voters. The Green Party is at 7% while the Bloc Quebecois is at 5%. Since our previous survey in September, the Liberal Party is up 3-points, the Conservative Party is up to two while the NDP is down four points among committed voters. This is the lowest we have had the NDP since the 2011 Federal Election. Among all eligible voters (the full sample), 26% said they vote for the Liberal Party (up three since September) while 25% would vote Conservative (up two points) and 18% would vote NDP (down three points). Twenty-one percent of respondents said they were undecided, down one point since September. In British Columbia, the poll found a close three-way race between the Liberals, NDP, and Conservatives (BC NDP 31%, LPC 30%, CPC 27%) while in Alberta, the Conservative Party has over a 30-point lead over the second place Liberal Party (AB: CPC 57%, LPC 24%, NDP 12%). In Ontario, the Conservative Party has a small six-point lead over the Liberals (38% vs. 32%) , while the NDP is well back in third at 22%. In Quebec, the Liberal Party now leads the NDP by eight with 34% of committed voters saying they would vote Liberal compared with 26% for the NDP. The BQ is at 19% while the Conservative Party is at 15%. In Atlantic Canada, despite a small sample size, the Liberal Party has a large lead over the Conservative Party and the NDP. Demographically, the Liberals lead by eight points among those with a university degree, while the Tories do best among those aged 60 and over (42% would vote Conservative). Female voters are almost evenly split three ways between the Liberals (31%), the Conservatives (30%), and the NDP (27%), while male respondents were equally as likely to vote Liberal or Conservative (34% respectively) than the NDP (19%). When we consider that 92% of committed voters consider themselves to be in the middle class (ranging from lower middle to upper middle) it’s no wonder that all the federal party leaders talk a lot about and to these voters. But none of the parties have a large advantage among the different types of “middle class” voters. Among those who consider themselves “lower middle class” the Liberals, Tories, and NDP are tied with each getting the support of about three in ten committed lower middle class voters. Among the 50% who place themselves squarely in the middle class category, the Liberals and Tories are tied with about one in three supporting either party with another 21% supporting the NDP. Among those who see themselves as upper middle class, the results are similar with the Liberals and Tories tied at 35% with the NDP well back at 17%. When we compare vote intention across household income we see somewhat different results than with the self-identified class question. The Liberal Party leads or is tied for the lead with every income group except for those who live in households that make between $75,000 to $100,000. The NDP does best interestingly among those who live in households that make less than $35,000 per year and those in the $75,000 to $100,000 income group. The Tories perform best with respondents whose household income is $50,000 or more earning the support of at least 34% of respondents in those groups. The results indicate two things: (1) that most Canadians self-identify as middle class and (2) neither party has an advantage among these voters but that appealing to these voters and connecting with them could mean significant political benefit. Along with vote intention, we also asked respondents which party leader they believed would make the best Prime Minister. Justin Trudeau and Stephen Harper were statistically tied with 26% of respondents choosing Trudeau and 24% choosing Harper. NDP Leader Tom Mulcair was a distant third with 12% picking him as the individual who would make the best Prime Minister. Interestingly, among those who voted NDP in 2011, 34% picked Trudeau as best Prime Minister compared with 24% who picked Tom Mulcair. Another 32% of 2011 NDP voters were unsure which leader would make the best Prime Minister. Among those who voted Conservative in 2011, 62% believed Stephen Harper would make the best Prime Minister followed by 15% who picked Justin Trudeau and 2% who picked Tom Mulcair. Among respondents who voted Liberal in 2011, 56% picked Liberal Leader Justin Trudeau as best Prime Minister followed by Tom Mulcair at 7% and Stephen Harper at 6%. Twenty-seven percent of 2011 Liberal Party voters were unsure which leader would make the best Prime Minister. When asked for their overall impressions of the three main party leaders, the only real change was with Tom Mulcair. The percentage of respondents with a positive impression of Tom Mulcair dropped by eight points since June 2013 from 34% to 26%, the last time we reported on these numbers. Justin Trudeau remains the most popular leader in Canada with 39% of respondents saying they have a favourable impression of the Liberal Leader (down one point since June). Trudeau’s unfavourable numbers are also down slightly to 24%, from 26% in June. Prime Minister Harper’s numbers have not moved much at all since June. Twenty nine percent of Canadians have a positive impression of him while 46% have an unfavourable impression. Only 22% of Canadians say they have a neutral impression of the Prime Minister. This poll was conducted after the federal government’s Speech from the Throne but before Senator Mike Duffy’s speech defending himself in the Senate. Therefore, it cannot capture any impact of Senator Duffy’s allegations and the political fallout of the Senate expense scandal. That being said though, the results can be used as a benchmark of federal party support right before the drama that took place in the Senate over the past few days. Support for the federal Conservative Party and Liberal Party is up slightly in our survey while NDP support is down. Trudeau remains the most popular leader in the country and is tied with Stephen Harper on who would make the best Prime Minister while NDP Leader Tom Mulcair continues his struggle to gain traction with Canadians outside of Quebec. These results are particularly troublesome for the NDP. It’s the lowest NDP support in our polls since the May 2011 election. The party is a distant third in vote rich Ontario, is now second to the Liberal Party in Quebec. The NDP remains competitive in British Columbia but has to contend with a revived Liberal Party in Canada’s westernmost province. In Quebec, Mulcair is viewed positively by 45% of eligible voters. But outside of his home province, his favourable rating barely gets above 20% in important battlegrounds like Ontario (20%), BC (22%) and in Atlantic Canada (18%). Most Canadians in these provinces or regions have a largely neutral impression or don’t know much about the NDP leader. The survey was conducted online with 1,459 respondents in English and French using an internet survey programmed and collected by Abacus Data. A random sample of panelists was invited to participate in the survey from a representative panel of Canadians. The survey was completed from October 18 to 22, 2013. The margin of error for a probability-based random sample of 1,459 respondents using a probability sample is +/- 2.6%, 19 times out of 20. The data was weighted according to census data to ensure that the sample matched Canada’s population according to age, gender, education level, and region. Totals may not add up to 100 due to rounding. According to a provincial survey of eligible voters in Nova Scotia, the NS Liberal Party leads the NDP by 19 points among committed and leaning voters. Overall, 32% of eligible voters said they plan or have voted for the Liberal Party, followed by the NDP at 18%, the PCs at 14%, and the Green Party at 0.4%. Thirty-two percent of eligible voters say they are still undecided while 5% of respondents have already voted but refused to identify who they voted for. All observed changes are inside the margin of error for the survey. Among committed and leaning voters, the Liberals lead with 48%, followed by the NDP at 29%, and the PCs at 22%. The Green Party received 1% of the vote. Compared with yesterday’s poll, the observed change is marginal and inside the margin of error for the survey. Today’s results are very similar to those reported yesterday. There have been small marginal shifts in vote intention, leader evaluations, and top issue. The Liberal Party remains well positioned in the Nova Scotia provincial election. Among all committed voters, it leads the NDP by 19 percentage points, has the most popular leader, and is considered best able to manage the economic situation in Nova Scotia.Indeed, economy is the main factor that decides the development of a country! While the idea of being a good citizen and participating in the electoral programs to choose the best leader for the country is appreciated, you should also choose your own ways to improve your economy! If you are eager to know such ways then, why not check here? Not only does the Liberal Party lead province-wide up it has large leads over the other parties on Cape Breton, in the Northern region of the province, and in the Annapolis Valley / South Shore region. In the HRM, Liberals also have a small lead over the NDP. The Liberals also lead among other subgroups including men, women, all age groups, and levels of education. Overall, 31% of eligible voters said they plan or have voted for the Liberal Party, followed by the NDP at 18%, the PCs at 14%, and the Green Party at 0.4%. Thirty-two percent of eligible voters say they are still undecided while 5% of respondents have already voted but refused to identify who they voted for. All observed changes are inside the margin of error for the survey. Regionally, the NS Liberals are strongest outside of Halifax, where they hold a majority of support in the North (54%) and the South Shore/Annapolis Valley (55%). With three days of interviews our confidence in the regional numbers is significantly improved. The race in Halifax Regional Municipality is much closer with the Liberals barely edging the NDP 42% to 35%. Of particular note is the shift in support from the 2009 provincial election. While the Liberal party has managed to retain about nine in ten voters from 2009, only 49% of those who voted NDP in the previous provincial election indicated that they would support the party again this time with the bulk of switchers now voting for the Liberal Party. If the NDP hopes to stage a comeback in the next five days of the campaign, it must reconnect with past voters and convince them that they deserve to be re-elected. Along with his party, Dexter’s personal base of support has shifted away from him. Overall, 62% of Nova Scotians feel that it’s time for a change (down 3 points since yesterday), while just 23% said that Dexter deserves to be re-elected (up 3 points), and 15% were unsure. Significantly, almost a majority (49%) of those who voted NDP in the 2009 provincial election felt that Dexter has outlived his time in office, with 43% stating he deserves to be re-elected. Even in Halifax, where NDP support is strongest, only 28% of eligible voters in the region think the NDP and Darrell Dexter deserve to be re-elected. Jobs and the economy, health care, education and taxes remain the most important issues facing Nova Scotia according to eligible voters in Nova Scotia. Of the 35% of eligible voters who mentioned the economy or jobs, 26% believed the Liberal Party was best able to deal with the issue followed by the NDP (22%) and the PC Party (16%). Overall, 36% of eligible voters were not sure which party would be best on the issue. While the economy is the single most important issue in the campaign, none of the parties have a significant advantage among those who care the most about the issue to mention it unprompted in our survey. Among the one in four Nova Scotians that selected health care as their top issue, the Liberal Party was chosen as best to handle the issue by 27% followed by the NDP at 18%, the PC Party at 10% while 45% of those who believed health care was the top issue were unsure which party was best. It is clear that on issue positioning, the Liberals have an advantage on most of the key issues. Neither the NDP nor the PC Party have a clear issue advantage on any issue of prominence for eligible voters. 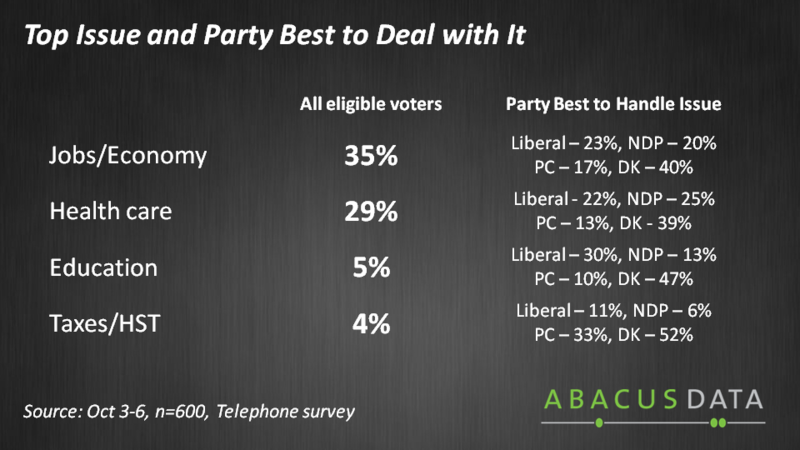 When all respondents were asked specifically which party they believed would be able to handle the economic situation in Nova Scotia best, 31% of eligible voters elected the Liberal Party, followed by 19% who selected the NDP Party and 16% who selected the PCs. Twenty-six percent of respondents were unsure. These numbers are largely unchanged from yesterday’s poll. Overall, virtually no statistically significant changes were observed between October 1st and 2nd regarding who Nova Scotians think would make the best Premier. When respondents were asked which party leader they believed would make the best Premier, the results again mirrored the vote intention question. Thirty-two percent of respondents selected Liberal Leader Stephen McNeil while 21% selected incumbent Premier and NDP Leader Darrell Dexter. PC Leader Jamie Baillie was third at 15% among all eligible voters. However, uncertainty remained consistently above 30%. Just over one in three eligible voters in Nova Scotia (37%) had a positive impression of incumbent NDP Leader Darrell Dexter while 44% had a negative impression. Finally, respondents were asked which political party they believed would ultimately win the Nova Scotia provincial election. A majority of voters (52%) believed that the Liberal Party will win the election, while only 12% felt the NDP will win. However, on October 1st, 32% of NDP supporters felt the Liberals would win the election; today’s tracking showed that support shift back. On October 2nd, 22% of NDP supporters felt the Liberals will win, with 57% feeling the NDP will hold on to leadership. Although not reflected in the overall figures, this change may signal an internal change in confidence amongst NDP supporters and could have an impact on voter turnout. The analysis in this report is based on telephone interviews conducted September 30 to October 2, 2013 among a provincial sample of 700 eligible voters in Nova Scotia. Interviews were conducted in English and 6,116 telephone numbers were dialed. Each evening up to and including Sunday October 6 (except for Friday evening), 200 to 250 interviews will be conducted with a random sample of eligible voters in Nova Scotia. The results of the poll will be released on Battleground with David Akin on the Sun News Network each evening at 7pm AT / 6pm ET. The data was statistically weighted according to the 2011 Census according to age, region, gender, and education. The margin of error for this survey is + 3.8%, 19 times out of 20. Note, the margin of error in subgroups with small sample sizes is much larger. The survey was commissioned by the Sun News Network. 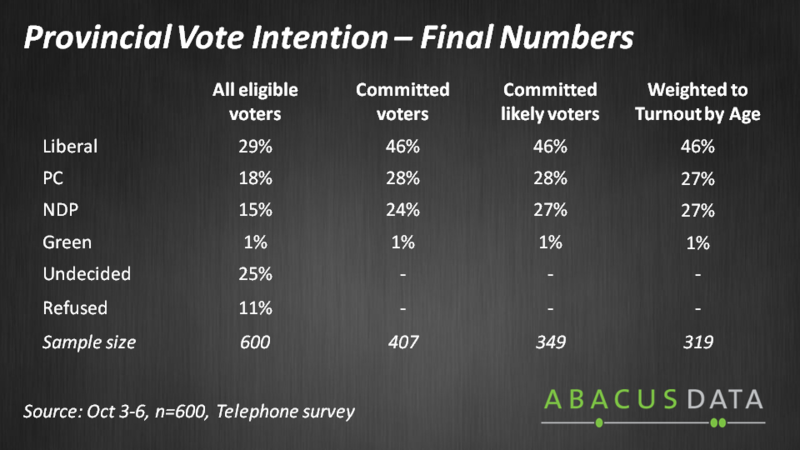 For more information about the poll’s methodology or the results, please contact David Coletto, CEO at david@abacusdata.ca or at 613-232-2806. The final Sun News/Abacus Data poll of the 2013 Nova Scotia election finds that the Liberal Party well positioned to win on Tuesday October 8 while the NDP and Progressive Conservative Party are in a fight for second place. Overall, 29% of eligible voters said they plan or have voted for the Liberal Party (down 2), followed by the PC Party at 18% (up 2), the NDP at 15% (down 4), and the Green Party at 1%. Twenty-five percent of eligible voters say they are still undecided (down 1) while 11% of respondents have already voted but refused to identify who they voted for. All observed changes are inside the margin of error for the survey. Among committed and leaning voters, the Liberals lead with 46% (unchanged), followed by the PC Party at 28% (up 3) and the NDP at 24% (down 4). The Green Party received 1% of the vote. Compared with yesterday’s poll, the observed change is marginal and inside the margin of error for the survey. Among likely voters, the Liberal Party continues to lead with 46% among committed likely voters followed by the PCs at 27% and the NDP at 26%. 20% of eligible voters surveyed said they had already voted in the election. Our final tracking poll finds that Liberal Party has a comfortable lead among committed and likely voters and is likely going to win the Nova Scotia election if voter preferences do not change dramatically over the next 24 hours. The real fight in the election is for second place. Our latest numbers have the PC Party with a marginal lead over the NDP for second (28% vs. 24%) but tied among those most likely to vote. Keeping in mind the margin of error for the survey, we are unable to forecast which party will the second most number of voters. As always, the final results will depend on turnout and our polling cannot anticipate whether the NDP, PC Party, or Liberal Party will have a better Get Out The Vote operation. Regionally, the NS Liberal continue to be strongest in the North and South Shore/Annapolis Valley while running neck and neck with the Tories on Cape Breton. In Halifax, the Liberals have a 12-point lead over the NDP. The Liberal Party continues to lead among all demographic groups but the race has tightened somewhat among those aged 60 and over. Among committed voters who voted NDP in 2009, 49% say they will vote NDP while 35% plan to vote Liberal. Among all previous NDP voters, 10% are still undecided. A considerable majority of eligible voters in Nova Scotia continue to believe it is time for a change in the province while less the one in four eligible voters (22%) believe Darrell Dexter and the NDP deserve to be re-elected. We have seen very little change in these numbers over the last five days of polling. Jobs and the economy, health care, education and taxes remain the most important issues facing Nova Scotia according to eligible voters in Nova Scotia. These numbers have not changed much throughout the final week of the campaign except for health care which has increased by five points since the start of our tracking. None of the three main parties have a clear advantage on the top two issues that voters care the most about. Among those who identified either the economy or health care as their top issue, none of the parties have a substantial advantage when respondents are asked which party is best at dealing with the issue.But, you don’t be so indecisive when it comes to choosing the best way that could improve your economy! Yes, as the universally favored Forex trading procedure using the sophisticated Tesler App platform is readily available now, to boost your financial position, which is undoubtedly the best way for you and everyone! When we look at all respondents and at all issues identified, we find that the Liberal Party has a slight advantage on issue position with 22% of all eligible voters saying the Liberal Party is best to handle the issue they care most about followed by the NDP 18% and the PC Party 16%. A full 43% of respondents did not know which party could best handle the issue they cared most about. While the Liberal Party has lost its advantage among those who believe jobs and the economy are the top issues facing the province, the party still has a substantial lead among all eligible voters when they are asked which party they believe would be best able to handle the economic situation in Nova Scotia best. Thirty-two percent of eligible voters selected the Liberal Party, followed by 18% who selected the NDP and 17% who selected the PC Party. Twenty-three percent of respondents were unsure. There was little change in perceptions about which party leader would make the best premier. When respondents were asked which party leader they believed would make the best Premier, the results again mirrored the vote intention question. Thirty-one percent of respondents selected Liberal Leader Stephen McNeil while 19% selected incumbent Premier and NDP Leader Darrell Dexter. 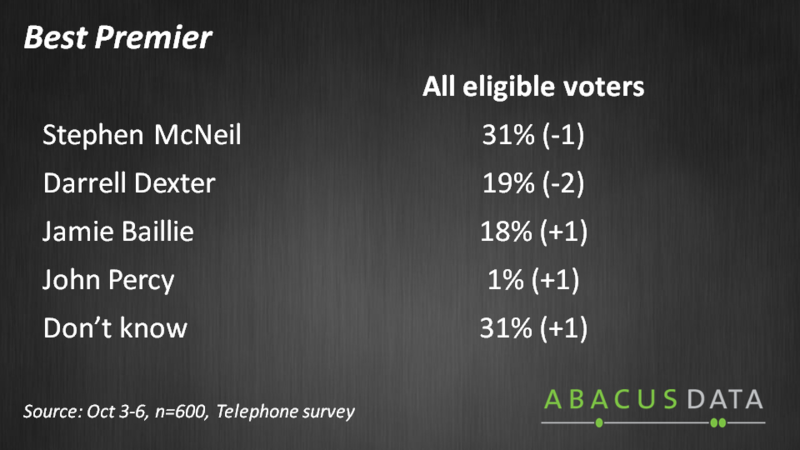 PC Leader Jamie Baillie was third at 18% among all eligible voters while 31% were unsure. When it comes to overall impressions of the main party leaders in Nova Scotia, our tracking finds that Stephen McNeil’s personal numbers have not changed at all and he remains the most popular leader in the province.. A slight majority still have a positive impression of the Liberal Leader. PC Leader Jamie Baillie’s personal numbers have not changed over the weekend with 41% of eligible voters having a favourable impression of the PC Leader while 33% have a negative impression. Darrell Dexter remains a polarizing figure with 37% of eligible voters having a positive impression of the NDP leader while 47% have a negative impression. Finally, respondents were asked which political party they believed would ultimately win the Nova Scotia provincial election. A majority of voters continue to believe (59%) that the Liberal Party will win the election, up four points since Friday’s release, while only 12% felt the NDP will win. The analysis in this report is based on telephone interviews conducted October 3 to October 6, 2013 among a provincial sample of 600 eligible voters in Nova Scotia. Interviews were conducted in English and 5,380 telephone numbers were dialed. The results of the poll will be released on Battleground with David Akin on the Sun News Network each evening at 7pm AT / 6pm ET. The data was statistically weighted according to the 2011 Census according to age, region, gender, and education. The margin of error for this survey is + 4.1%, 19 times out of 20. Note, the margin of error in subgroups with small sample sizes is much larger. According to a new survey from Abacus Data, less than one in two Canadians (48%) were aware that Canada and the European Union were currently in negotiations over a free trade agreement between the two jurisdictions. Despite the low awareness levels, a majority of Canadians believed that a Canada-EU free trade deal would have a positive effect on the Canadian economy. Overall there was low awareness among Canadian respondents of free trade agreement talks with the European Union. Over half (52%) of Canadians said that they were unaware of the government’s trade discussions with the EU. Fewer, forty-eight per cent (48%) said that they were aware of trade talks before completing the survey. There was little regional distinction when it comes to awareness of the trade deal but interestingly, Conservative Party supporters were less likely to be aware of the trade talks than NDP or Liberal Party supporters. It is no surprise that the politically disengaged are less likely to be aware of political issues such as free trade talks with Europe. Among young people, aged 18 to 29, awareness was much lower than that of older Canadians (only 36% compared with 60% among those aged 60 and over). Overall, a majority of Canadians (55%) believed that a free trade agreement between Canada and the European Union would have a positive impact on the Canadian economy. However, only 11% believed it would have a “very” positive impact indicating that opinions are likely soft and the positive reaction to “free trade with Europe” is a result of the default pro-trade position of most Canadians. Very few Canadians (11%) believed that a free trade deal with Europe would have a negative effect on the Canadian economy. Those who were aware of trade talks were more likely to believe a free trade agreement with the EU have a positive impact on the Canadian economy. Those who were unaware were more likely to say that they are unsure about whether this would be good for the economy or not. Given low awareness of the issue, there is room for influence in opinions about whether this would be a good or bad influence on the Canadian economy. Those with low levels of awareness who are civically disengaged are particularly open to influence on this issue. Respondents were asked for their opinion about two contentious aspects of a deal rumoured to be included such as whether or not our government should allow European companies to bid on large infrastructure projects and on whether or not we should allow free imports from European dairy producers. Overall, there some disagreement among Canadians on both issues. When it comes to allowing European dairy producers to sell more of their products, like cheese, in Canada, forty-six per cent (46%) either somewhat or strongly supported this proposal. A little less than one third (31%) of Canadians say they were opposed to the idea of increased access for European dairy producers. Opposition to allowing more access for European dairy producers was highest among those living in rural communities (42%), in Quebec (37%), and among NDP supporters (36%). There was greater opposition to the idea of allowing European companies to bid on contracts for large infrastructure projects in Canada. Forty-two per cent (42%) said they were opposed to the idea allowing European competition on large Canadian infrastructure projects while one in three (33%) said they support allowing competition. The remainder of Canadian respondents (26%) said they would neither support nor oppose competition on Canadian infrastructure projects. Opposition to this proposal was greatest among rural respondents (55%) and those over the age of 60 (56%). The Harper Government has made a free trade deal between Canada and the European Union a centrepiece of its Economic Action Plan. But less than half of Canadians are even aware that a deal is being negotiated. There is both good and bad news for the federal government in these numbers. The good news is that most Canadians reactive positively to a free trade deal with the EU in principal. A majority believe it will have a positive impact on the Canadian economy and very few believe it will have a negative impact. The bad news is that the devil is always in the details. Many Canadians would oppose parts of a deal that include allowing European construction companies to bid on infrastructure projects in Canada while Canadians living in rural communities are opposed to allowing greater access to the Canadian market for European dairy producers. If a deal is signed, communicating the benefits of the deal will be critical. Canada is a trading nation and in general, Canadians respond positively to free trade. But explaining the more complicated and controversial aspects of a final deal will be important especially with a key part of the Conservative coalition – rural Canada. As part of my presentation to the Ontario Energy Association’s ENERGYCONFERENCE13, I asked Canadians about their views on different sources of electricity. At the conference, I released the results for Ontarians only but I wanted to share what Canadians across the country think about different sources of electricity and how they compare across region, education level, and political support. In this post, I report on two questions we asked: (1) overall impressions of different ways to generate electricity and (2) perceptions about how their province generates electricity. Generally speaking, Canadians have a pretty good understanding of where their electricity comes from. On average, respondents estimated that 43% of electricity generated in Canada comes from hydroelectric compared with 20% from natural gas and 13% from nuclear. When asked about the different sources of electricity, a large majority of Canadians have a positive impression of hydroelectric, solar, wind, and natural gas generation. Impressions were more mixed when it comes to nuclear power and only a small minority of Canadians have anything good to say about coal powered electricity generation. Canadians love hydroelectric power and Canadians from across Canada agree on that. Nationally, 77% of respondents to our survey said they have a positive impression of hydroelectric power compared with only 4% who had a negative impression. When asked to rank seven sources of electricity from most to least environmentally friendly, 28% of respondents ranked hydro first or second and only 7% ranked it as 1st or 2nd most harmful to health and safety. Hydro power is perceived to be clean, safe, but not as cheap as other sources of electricity. Canadians recognize the importance of hydroelectric power to Canada’s economy and energy mix and generally have positive feelings about it. You can’t go wrong with hydroelectric power. Nationally, 79% of Canadians have a positive impression of wind energy compared with 8% who have a negative impression. Wind powered electricity has seen its share of controversy in Canada’s largest province. While wind energy is viewed positively by almost all respondents in Atlantic and Western Canada and in Quebec, it’s reputation is somewhat weaker in Ontario at 70%, nine points lower than the national average. When asked to compare wind energy to other sources of electricity, 69% of Canadians rank wind energy as 1st or 2nd when it comes to environmentally friendliness, and only 12% ranked it in the top 1 or 2 in terms of its negative impacts on health and safety. Like hydro power, wind energy is perceived to be clean, but a large proportion of Canadians (28%) rank it as the 1st or 2nd most expensive source of electricity. Natural gas is the carbon-based fuel that gets a lot of love from Canadians. Overall, two thirds of Canadians have a positive impression of natural gas compared with 7% who have a negative impression. There is little variation in opinion across the country with Albertans being somewhat more likely to have a positive impression of the fuel source than other Canadians (Alberta 79% positive vs. Canada 67%). Natural gas is perceived to be environmentally unfriendly or unsafe as less than one in five Canadians ranked it as least or 2nd least in terms of safety or environmentally friendliness. Unlike the three electricity sources above, nuclear power’s reputation in Canada is far less positive. Only 25% of Canadians have a positive impression of nuclear power while 48% have a negative impression. Outside of Ontario (where it is most popular at 41%), nuclear has a weak impression with less than one in five Canadians living in BC, Alberta, Quebec, and Atlantic Canada saying they have a positive impression of nuclear. Compared with other electricity sources, nuclear power is ranked as least or 2nd least environmentally friendly by 63% of Canadians and 69% rank it as most or 2nd most harmful to human health and safety. Along with views that its not clean or safe, 50% of Canadians believe that nuclear is either the most or 2nd most expensive way to generate electricity. Coal is viewed most negatively by Canadians. Only 12% of Canadians have a positive impression of coal powered electricity generation while 61% have a negative impression. Over seven in ten Canadians (72%) rank coal as either least or 2nd least environmentally friendly and two thirds rank its as most or 2nd most harmful to human health and safety. It is also considered most or 2nd most expensive among 21% of Canadians. There is no region in the country that has a positive impression of coal powered electricity generation. In an effort to understand what Canadians know about Canada’s electricity mix, we asked respondents to estimate what percentage of their province’s electricity is generated from seven possible sources of electricity. Respondents were free to enter any number ranging from 0 to 100 for each source with a total that must add up to 100. On average, Canadians estimated that 43% of their provinces energy was generated from hydro, 20-points lower than the actual percentage as reported by the Canadian Electricity Association. Natural gas was second at 20% followed by nuclear power at 13%. Canadians have a pretty good understanding of where their electricity comes from – except when it comes to renewable energy. Across the country, respondents overestimated the importance of renewable sources of electricity such as wind, solar, and biomass, and underestimated the importance of another renewable source hydro power. This is especially true in Ontario where all the discussion about the province’s Green Energy Act has likely caused perceptions about Ontario’s energy mix to seem more “renewable” and “green” than it really is. According to the Sun News/Abacus Data provincial survey of eligible voters in British Columbia, the BC NDP leads the BC Liberals by 10 points among decided and leaning voters. The BC NDP has the support of 43% of decided voters followed by the BC Liberals at 33%, the BC Greens at 12%, and the BC Conservatives at 9%. Regionally, the BC NDP is strongest on Vancouver Island (57%) where it leads the BC Greens by 33 points and the BC Liberals by 43 points. In Greater and Metro Vancouver, the race is much closer with the NDP only marginally ahead of the BC Liberals (40% BC NDP vs. 37% BC Liberals). Demographically, the BC NDP leads among all subgroups include men (NDP 39%, Lib 35%), women (NDP 47%, Lib 31%), those aged 18 to 29 (NDP 39%, Lib 34%) and aged 30 to 44 (NDP 43%, Lib 29%). However, the two main parties are closer among those aged 60 and over (NDP 44%, Lib 41%). “A silver lining for the BC Liberals is that they are competitive where most of the seats are (Greater Vancouver) and among more reliable voters (those 60 and over),” said Abacus CEO David Coletto. “With only a slight increase in popular support since 2009, this election is less about a popular NDP than it is about a less popular BC Liberal Party,” said Coletto. The table above reports how current vote intentions compare with voter behaviour in the 2009 provincial election. For example, among current NDP supporters, 67% voted NDP in 2009 while 14% voted for the BC Liberals and 3% voted Green. Among current BC Conservative supporters, only 9% of its current supporters voted for the party in 2009. Almost a majority of its current supporters voted for the BC Liberals in 2009 while another 33% said they did not vote or can’t remember how they voted. This demonstrates the impact of a stronger BC Conservative Party on the electoral prospects of the BC Liberals. However, even if half of the BC Conservative/BC Liberal switchers returned back to the BC Liberals, the Liberals would still be seven points behind the NDP. To win, the Liberals need to bring past supporters who have left to support both the NDP and Conservatives. Only if they accomplish this can they compete with the larger NDP supporter pool. The survey also asked respondents how they voted in the 2011 federal election. The table below reports the composition of current provincial support by voting behaviour in the 2011 federal election. What the data demonstrates is that all four provincial parties are coalitions of different federal voters but that current BC Liberal supporters are the most diverse. Among those respondents who said they would vote BC Liberal, 55% voted for the federal Conservatives in 2011 while 33% voted for the federal Liberals. Only 3% cast a ballot for Jack Layton and the federal NDP. BC Conservative support is less diverse in terms of federal party voters with almost three in four BC Conservative supporters saying they voted for the federal Conservative Party in 2011 with another 16% saying they voted Liberal. “When you look at how federal party supporters are voting in the provincial election, it makes sense why Tom Mulcair is in the game but Stephen Harper and Justin Trudeau are staying away,” said Coletto. Another challenge for the BC Liberals is that are playing in a smaller voter pool compared with the NDP. When respondents were asked if they would consider or not consider voting for each of the main political parties in British Columbia, the BC NDP had the largest pool of accessible voters. Fifty percent of respondents said they would consider voting for the BC NDP, compared with 41% for the BC Liberals, 34% for the BC Greens, and 27% for the BC Conservatives. When we compare voter conversion rates (% of respondents indicating they will vote for a party divided by the % of respondents who would consider voting for a party) we find that the BC NDP has the highest conversion rate (76%), followed by the BC Liberals (71%), and the BC Conservatives (35%). “The smaller parties like the Greens and Conservatives are facing a highly polarized election meaning unless one of the two main parties make a big mistake, it will be difficult to grow their support in the next two weeks of the election,” said Coletto. British Columbians are split on whether they think the province is headed in the right direction or off on the wrong track. One in three respondents (33%) believed that the province is headed in the right direction while 37% believe it is headed on the wrong track. Another 30% were unsure. Most worrisome for the BC Liberals is that only 55% of those who voted BC Liberal in 2009 believed that the province was headed in the right direction. Another 24% believed it was headed on the wrong track while 21% were unsure. Turning to the four main political party leaders, the Sun News/Abacus Data poll found that none of the four leaders are particularly popular in British Columbia. Respondents were asked to rate their overall impression of the leaders on a scale of 0 to 10, where 0 means they really dislike the individual and 10 means they really like the leader. Overall, none of the four leaders had a net positive rating (more people viewed them positively than negatively). In fact, no leader was viewed positively by more than a quarter of respondents. NDP Leader Adrian Dix was viewed positively by 23% of respondents compared with 24% who had a positive impression of Liberal Leader Christy Clark. Conservative Leader John Cummins had a favourable rating with only six percent of respondents while 14% held the same positive views of Green Leader Jane Sterk. While Adrian Dix and Christy Clark were about equal when it came to positive impressions, fewer respondents viewed Adrian Dix negatively when compared with his rival Christy Clark. Thirty-five percent of respondents had a negative impression of Adrian Dix while 42% had a negative impression of Christy Clark, a seven-point difference. When we compares leader favourability among a leader’s own supporters we find that NDP supporters are less likely to have a positive impression of Adrian Dix than Liberal supporters have of Christy Clark. Only 51% of NDP supporters have a positive impression of Adrian Dix compared with 61% for Christy Clark among Liberal supporters. Finally, respondents were asked to consider some favourable and unfavourable things that have been said about various politicians. They were shown a list of statements and asked whether they agree or disagree that the statements apply to Christy Clark and to Adrian Dix. On three of the seven measures, the difference between Dix and Clark is not statistically significant. About one in two British Columbians believe that Dix and Clark are qualified to be Prime Minister. Less than a majority believe they both have sound judgment and a majority consider them to be likeable. On qualifications, judgment, and likeability, neither candidate has a significant advantage over the other. But Adrian Dix does have an advantage over Christy Clark on the three remaining measures. British Columbians are more likely to agree that Dix understands the problems facing BC than Clark (Dix 61%, Clark 51%). They are also more likely to think he has a clear vision for BC compared with Clark (Dix 53%, Clark 45%). And there is a ten-point difference in the percentage of respondents who agreed that either leader is out of touch with ordinary people with 52% agreeing the statement applies to Christy Clark while 42% agreeing it applies to Dix. Perhaps most troubling for Christy Clark, the survey found that 65% of British Columbians agree that she is more style than substance. Even 42% of those who said they would vote Liberal agreed that Clark is more style than substance. With two weeks to go until the May 14 election and the leaders set to meet in the first and only televised debate tonight, the BC NDP is a strong position. It has a 10-point lead among decided voters over the BC Liberals. It has a big lead on Vancouver Island and is competitive with the BC Liberals in every other region of the province, including in Greater Vancouver. It’s leader, Adrian Dix, while not loved by the population, is respected being viewed as qualified, likeable, and empathic by a majority of British Columbians. While BC NDP support is not up significantly from the 2009 election, it is benefiting from the splintering of past BC Liberal support. Among those who voted Liberal in 2009, only 62% plan to vote BC Liberal again in 2013 with 16% shifting to the NDP and 11% going to the BC Conservatives. In contrast, the BC NDP is holding onto 82% of its previous support while picking up past Liberal, Green, and non voters to make up for the switchers. For the BC Liberals, there are some optimistic findings. First, the NDP lead is lower than polls released at the start of the campaign. Second, while the NDP is ahead, it is not because of strong affection for the NDP leader Adrian Dix. Third, NDP support is not up significantly since 2009 and only 37% of British Columbians believe the province is headed in the wrong direction. The BC Liberals have an opportunity to come back, but a lot will ride on the leaders’ debate tonight. The 2013 BC Election is far from over. The NDP leads but a victory on May 14 is far from certain. To win, the Liberals will need to convert every respondent who would consider voting Liberal into a voter on election day. The survey was conducted online with 1,042 British Columbians eligible to vote in the 2013 provincial election using an internet survey programmed and collected by Abacus Data. A random sample of panelists was invited to participate in the survey from a panel of over 500,000 Canadians. The survey was completed from April 23 to 26, 2013. The margin of error for a probability-based random sample of 1,042 respondents using a probability sample is +/- 3.1%, 19 times out of 20. The data was weighted according to census data to ensure that the sample matched British Columbia’s population according to age, gender, education level, and region. The survey was commissioned by the Sun News Network.